Image courtesy of PublicDomainPictures Halloween might seem like just a childs holiday but it began as an ancient Celtic festival. Participants dressed in costume and lit bonfires to chase away bad spirits. In Mexico, Halloween is referred to as Dia de Muertos and is used as a time to honor the dead in a joyous festival. Today, Halloween is a celebration of candy and dressing up in costume. Its certainly not as solemn as it used to be. So were going to celebrate Halloween the only way we know how: with a party! If you want to throw yourself a Halloween party, were here to help you out. Here are some tips: Costumes Its not Halloween unless you have a great costume. The most fun costume idea is to get a group of friends and all wear matching or corresponding costumes. For example, the Scooby Doo gang, the Teenage Mutant Ninja Turtles and the Ghostbusters are great options for your squad. If youre running on a tight budget and youre crunched for time, picking your costume gets a little harder. This Error 404 costume is easy and only requires a white tee and a marker. Be a ceiling fan by writing Go Ceiling on a plain shirt and carrying pom poms. While these costumes arent great, they get the job done. Snacks If youre throwing a party, youre going to have to feed all of the monsters coming to your apartment. These hot dog mummies might seem a little childish but trust us, theyre delicious! All youll need are crescent rolls and hot dogs. For those of you with a sweet tooth, a spider cookie will satiate you. You have to have grub to feed the hungry monsters partying away! Decorations Your home should look a little festive if youre going to be throwing a party. All you need are a few choice selections to make your home look spooky. There are a lot of options for no-carve pumpkins that require little effort and no mess! We love the cactus pumpkins from Apartment Therapy. To create these creepy spider webs all youll need are some black trash bags and scissors! 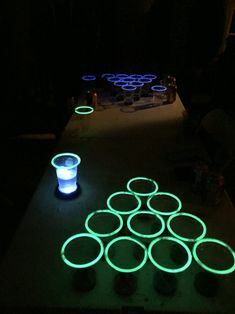 If everyone at your party is over 21 and youd like to indulge in a rousing game of beer pong, we recommend making it a little tougher by turning off the lights and using these epic glow in the dark cups. The most important thing to remember when throwing a party, however, is your Pierpont neighbors. Being considerate towards your neighbors will encourage them to do the same. Let them know ahead of time that youre throwing a party and even throw them an invite. Theyre more likely to be cool with your party if theyre invited to it. Once youve got all the ingredients for a great party, the last thing left to do is just enjoy! We hope you all have a safe and spooky Halloween. What are your best Halloween party tips? Whats the best costume youve ever made yourself? Share your photos with us on Facebook and Twitter.